Historically relevant areas within the built environment are often neglected by those who hold a stake in development processes in Brazil. A major argument regards the understanding of protecting properties and urban areas as a hindrance for current economic needs. However, existing literature mainly show compelling evidence that heritage conservation activities and effects may, in reality, favour the economic development of cities. Furthermore, governance factors may determine such outcomes from heritage. These are not sufficiently assessed in developing countries, which includes Brazil. 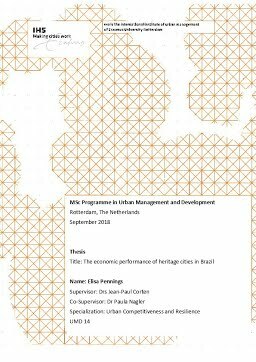 Through multiple regression analyses using secondary data of 5,530 out of the 5,570 Brazilian cities and a correlation analysis using primary data provided by municipal officers, this research aims at obtaining a broad picture of economic development and management of heritage cities. It has identified a positive relationship with gross domestic product (GDP), income and jobs. The predominance of touristic activities remains, however other important sectors contribute to the results. Surprisingly, public revenue is lower in heritage than in non-heritage cities, to a certain extent mediated by the also lower number of attracted investments. Regarding types of firms, an ongoing structural change is perceived, as primary sector firms are fewer and creative firms are found more frequently in heritage cities, while the mean number and size of firms are intermediate compared to non-heritage cities. An important moderating and mediating factor is the share of the higher educated population: It is larger in heritage cities, which in turn influence economic outputs. The most prioritized strategy by local governments is currently city marketing, perhaps as a reaction from the weak performance in that sense. Also highly prioritized, integrating the heritage areas into holistic urban development plans has shown to positively relate to economic indicators; However, stricter land regulations have rarely been applied. The main challenges for local managers are insufficient finance resources, related to low prioritization of such areas, conflicting interests by stakeholders and often problematic interaction within different levels of government. Interestingly, the lack of political willingness relates positively with investments attractiveness, which may imply that areas outside the protected boundaries have been prioritized by local politicians.